One of the things that tend to focus the mind here in Alaska is the volcanic activity along the Alaska Range and Aleutians. These are mostly andesitic vents driven by the subduction of the Pacific Plate under the North American Plate. But we here in Alaska sit downwind of a massively active region in the Kamchatka Peninsula which stretches south to the Kuril Islands and on to Japan itself. 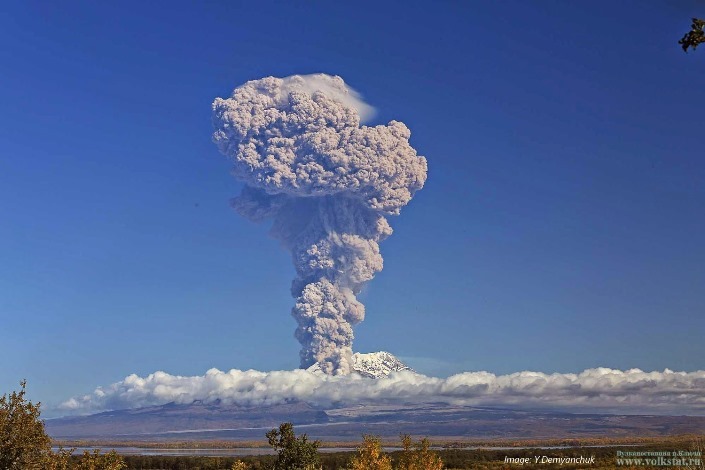 At any single moment, there are typically four active volcanoes on Kamchatka. The obvious question would be why is Kamchatka so active? What is tectonically driving the activity? 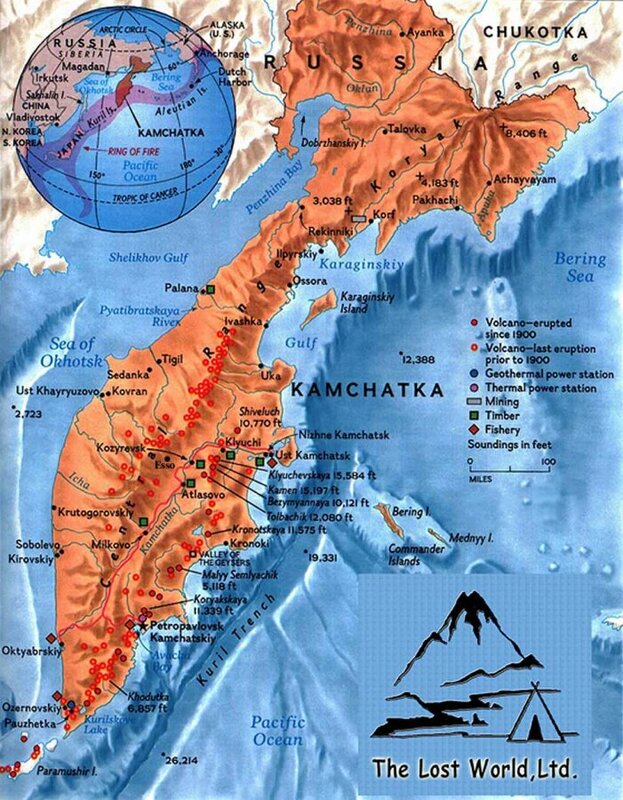 This post attempts to introduce the Kamchatka Peninsula from a tectonic standpoint. The Kamchatka Peninsula of Russia is a 1,250 km long peninsula on the far eastern edge of Siberia. It sits at the junction of a triple plate collision between the North American, the Pacific and the Eurasian Plates. 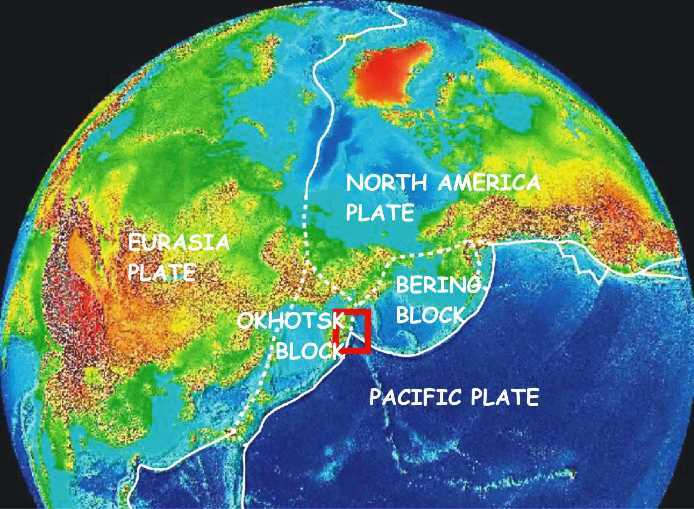 To make things even more interesting, it occupies something called the Okhotsk Block which is being shoved into the Eurasian Plate and borders on the Bering Block which defines the area north of the Aleutian chain of volcanic islands. The final interesting thing about Kamchatka is that there are at least a few papers out there that believe that the Emperor Seamount string is subducting under Kamchatka. There are two lines of volcanoes in Kamchatka. The westernmost line has for the most part not been recently active. Activity migrated eastward toward the trench constructing a line of active volcanoes stretching from central Kamchatka south to Japan. 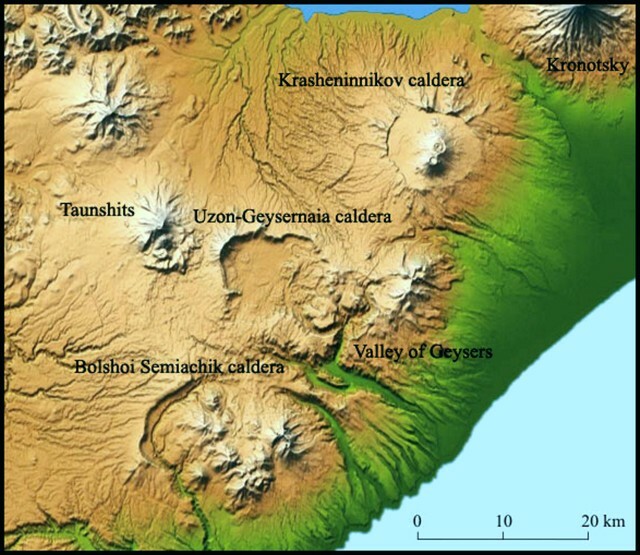 Recent volcanic activity does not extend north of a fault line in central Kamchatka. It does extend south along the Kuril – Kamchatka Trench, which plunges some 10 km into the Pacific Ocean. 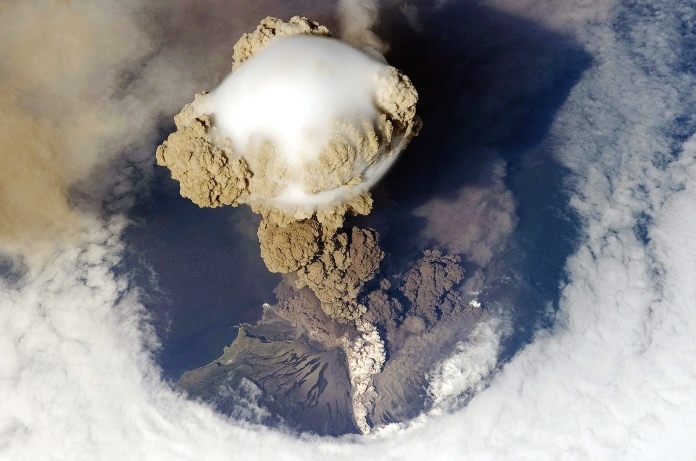 Volcanic islands comprising the Kuril Islands stretch some 1,300 km along the trench until it reaches the northern Japanese island of Hokkaido. Subduction – driven volcanoes parallel the line of the trench. 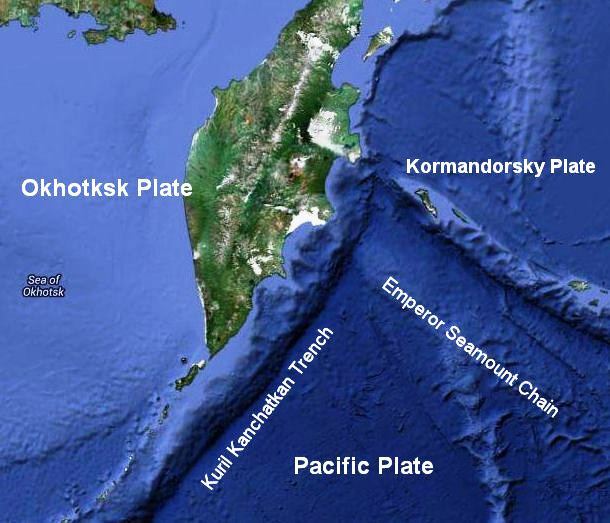 It appears to me that the crux of the matter with Kamchatka lies with the Okhotsk Block, also sometimes referred to as the Okhotsk Plate. It has two subduction boundaries. The main one on the west under the Eurasian Plate is thought to be inactive, which makes sense as there is no active volcanic activity. Russia’s largest island, Sakhalin is on the Okhotsk east of this boundary. 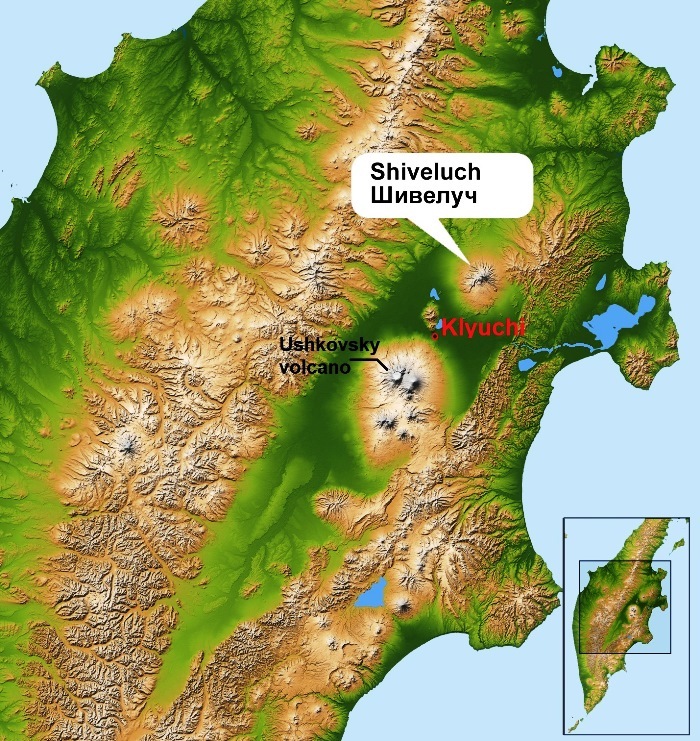 The western boundary is defined by the Kurile – Kamchatka Trench which is the surface expression of the subducting plate driving the volcanic activity. The southern boundary is not as well defined. Some define it as far north as the southern end of Hokkaido Island, Japan. Others define it as a triple junction plate boundary in central Japan. Still others define the area between the two limits as yet another platelet. 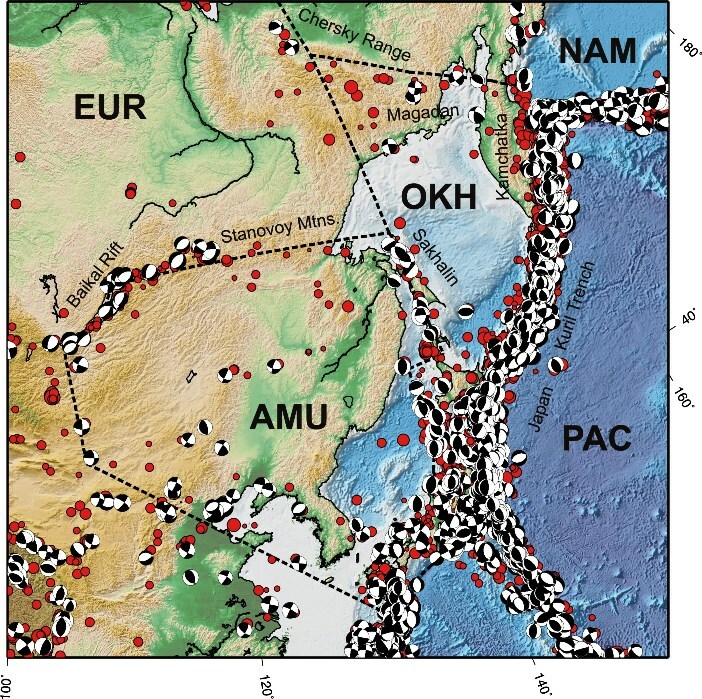 Large earthquakes like the Fukushima earthquake of April 2011 help define the boundaries. The northern boundary is defined by a transform fault called the Ulakhan Fault. The motion along the fault is generally westbound north of the fault. 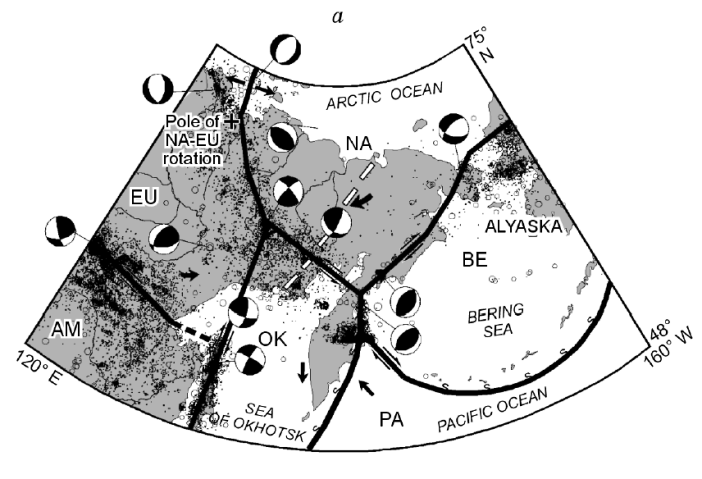 Since that subduction episode, the Okhotsk has been essentially squeezed between the Eurasian, North American and Pacific Plates. 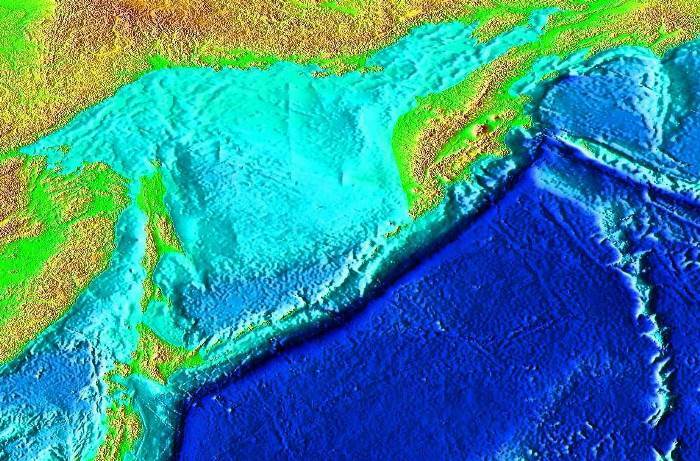 This has shallowed the Sea of Okhotsk bit by bit over the millions of years since the initial collision. This squeezing also imparted a small clockwise rotation along the Ulakhan fault. If you look at the maps, any time you have significant rotational tectonic forces on a block or plate along with known weak spots, rifting becomes a possibility. It is important to note that the vast majority of recent volcanic activity on Kamchatka is at or to the south of the triple junction / Alpha Fault line east-west line. 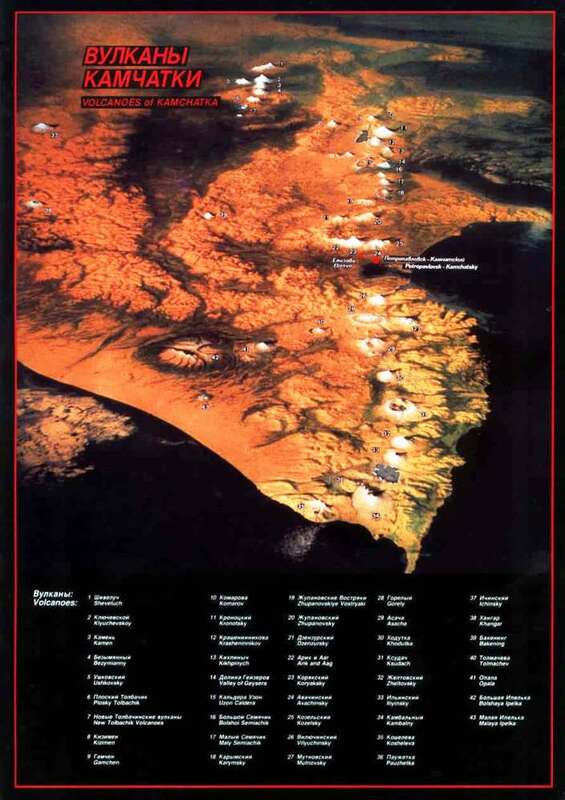 Tectonics drive everything we see in Kamchatka. And because the junctions are many and messy, there are lots of weak places for magma to make its way through the surface. Add to the festivities the thoroughly hydrated debris of the subducted Emperor Seamounts, and you have the recipe for a very active and dangerous volcanic region. 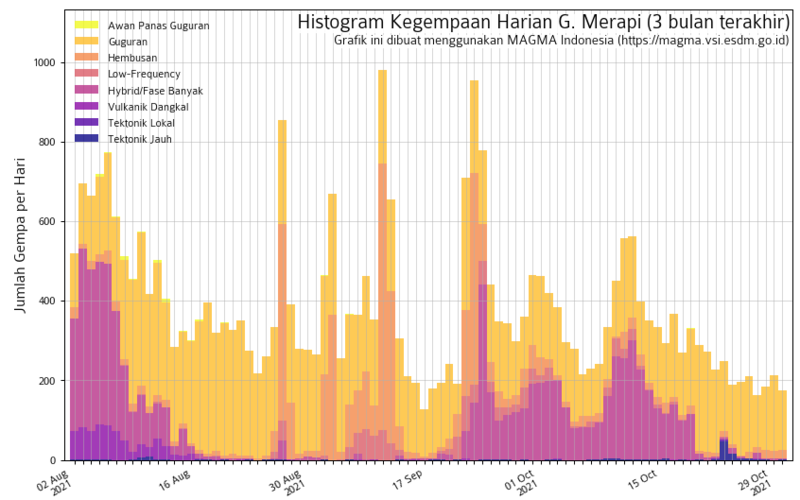 to change the layout of VolcanoHotspot to improve readability. This shall be implemented within the next 24 hours. Given on Wednesday, March 18, 2015. NtV riddles are dinged, and clues are added to the “leftovers” from the old batch! Hi Brenda, welcome and thanks a lot! I know you are igneous rock of the volcanoholics 😉 , hope you enjoy our blog as well! I can see it!!! I have taped four layers of brown packaging tape over an old pair of glasses, and just the sun is coming through it with it bite taken out of the circle! My friend just left Svalbard yesterday, I think I would have had to find a way to stay 2 more days, it looked very cold, but beautiful. I was just beginning to be a volcanoholoc in 2002 when I visited the Naples area. I did not see things like I do know…. Do you know some books about volcanoes, geology, ect. written for little ones (4+) or pupils? I have been looking for a book for my granddaughter (7) but haven’t found a good one yet, But during my researches for articles I have run across some good websites in English for kids, maybe they recommend books as well? Google for “How … (e.g. volcanoes, earthquakes etc.) work” or so. I did this nearly 2 years ago. This is a view of the Tolbachik – Shiveluch area earthquakes between 2011 and 2013. Pretty lively place. I’d kept a “window” of 2000 quakes to avoid overcrowding.